I LOVE a good Bloody Mary! Which is really funny because I dislike raw tomatoes. My husband always teases me because I usually only drink one and then move on to the next portion of the program. Because of my disdain for tomato juice, I am always on the search for a great Bloody mary mix. I hate to be picky but tomato juice straight up or V8 makes me shudder. I am shuddering now...ooof. I found a new love in the Powell & Mahoney Bloody Mary Mixers! They have created a great blend! This tasty mixture of bold tomato flavor, barrel-aged Worcestershire sauce, and all natural spices will tantalize your taste buds and pair perfectly with every brunch! What was really attractive is the ingredients were all things I could pronounce and a lot of these ingredients make my Bloody Mary's a success like : Organic Gluten-Free Vegan Worcestershire Sauce Organic Ginger Puree, horseradish and celery seed, all important go-to ingredients! 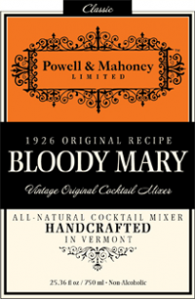 Powell & Mahoney have a TON of different mixers, check them out here. And if you get stuck for inspiration, each bottle comes with three recipes, allowing you to fill your glass with either your favorite standard or something new. No matter what you choose, Powell & Mahoney's all-natural mixers let you concentrate on raising your glass, not cutting up ingredients! Find them on Facebook and Twitter. Trust me, this will take the guess work out of your drink mixing forever!